I'm not sure where (or even if) to post this ... so I guess I'll post it here in Off Topic. I know many of you enjoy fancy, gourmet cooking and I admire and respect that ...... BUT, my own style is to find things that are super easy and quick and still taste wonderful. I've been making a quick and easy pasta dish that I absolutely love and thought I'd share it with you. If I need to make something in a hurry, I can go from scratch to serving dish in 20 minutes and it always impresses everyone who has tasted it. 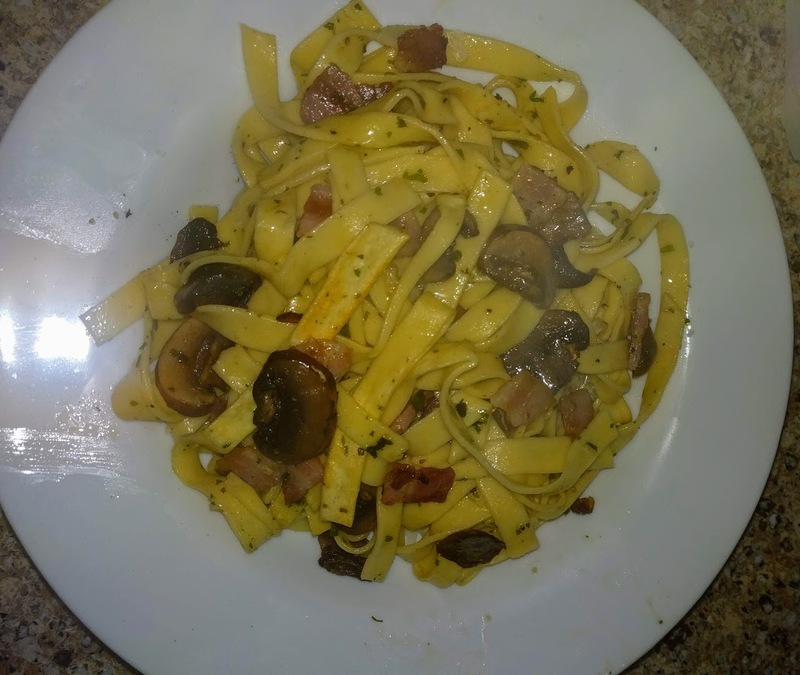 In a nutshell this dish is fresh pasta with garlic, mushrooms, onion, and bacon (I'm sure Pancetta would be even better but I use thick sliced, apple-wood bacon). Some parsley and basil and black pepper to season, lots of butter and grated Parmesan and/or Pecorino Romano cheese. I use no oil or salt in my dough - Just semolina flour and egg. You can make it with AP flour or even whole wheat flour ... but IMO it is well worth getting semolina (or Semola flour which is ground super fine). The texture and the taste is that much better. While your bacon is cooking, crush several cloves of garlic and saute in hot olive oil and/or butter. While the garlic is browning, chop some onion and toss into the hot oil with the now browned garlic. Sprinkle some parsley and basil flakes in with the onion. Your pot of salted water should just be boiling now ... so run your pasta thru the noodle cutter. My method is to cut the rolled pasta into shorter lengths (about 4") before I run them thru the noodle cutter so I end up with 4-5" noodles. Dump the noodles in the boiling water and stir occasionally. They only need 2 minutes in the boiling water, don't over boil them. Serve it with lots of grated cheese (Pecorino Romano is my choice) and black pepper to taste. I like a Sauv Blanc or a cold beer with this. There is enough for two, but you will want to eat it all yourself. It's much better to eat half now and put the rest in the fridge and heat it up and eat the second half in a few hours. Great looking dish, Andy! I am glad to read that I am not the only one who likes short noodles. My wife likes them long, so I cut the heck out of them when put on my plate. I mentioned this in a PM to you, but thought others might like to try the Olive Salad mix. It is outstanding on pasta, pizza, potato salad, salads, etc... Here is like link if anyone is interested. https://www.amazon.com/Boscoli-Olive-Salad-Italian-15-5/dp/B001HBVDY8/ref=sr_1_2?crid=13JPLWWNB4SG&keywords=olive+salad+for+muffuletta&qid=1554588201&s=gateway&sprefix=Olive+sala%2Cpets%2C173&sr=8-2 It was originally formulated for muffulettas. absolutely delicious!!! I'm going to have to dig through my cabinets and find my pasta roller now. I can't believe the dry looking pasta granules work but obviously they do. Lovely looking sheets of pasta. I will have to remember the spritz bottle to moisten the dough. Great idea. All the videos I've seen of people showing the dough process has much wetter dough and has them sprinkling flour on the sheets before and during the rolling. When the dough is that wet and sticky it can gum up the rollers unless you dust with flour. And then the pasta tends to stick together after you cut it unless you hang it to dry. I don't hang it to dry, I go straight from the roller into the boiling water and I don't want the noodles sticking to each other ... and I don't want the noodles dusted with flour to muddy up the water when they go in the pot. I've tried it many different ways and it works the best/fastest when the dough is just wet enough go easily thru the rollers and just dry enough to not need any dusting of flour. Then it rolls and cuts really easily without sticking at all to the machine and the noodles separate easily as they go into the boiling water. It's just the method I've settled on after trying it lots of different ways. It made my first-time pasta making experience pressure-free and fun! Approximately 1 cup flour : 1 egg makes it so easy to remember. And I had just one cup of semolina flour left. This homemade pasta was meant to be. 😊😊😊 I suppose I could boil the pasta longer than 2 minutes to adjust the firmness? I'm glad I don't have to waste any time for trial and error. Thank you, , for sharing! The dish looks very yummy and the shrimp perfect! Would you share your spices? You can boil the noodles to whatever texture you prefer. I roll mine out to the 4th setting on the roller - it seems thin but they plump up in the boiling water. There's that old bit about tossing noodles to see if they stick to the wall to tell if they are done. I just pull one noodle out and chew on it. It's all personal taste but I want to feel resistance as my tooth goes thru the noodle - but not rubbery. It's a balancing act and boiled too long makes the noodle feel too soft for my tastes. Also I should note that I don't rinse the hot noodles or anything to cool them, I just strain them into a mesh basket and then dump them into the skillet and the skillet is hot (but not sizzling - just the residual heat that cast iron retains) so the noodles continue to cook a little while they are absorbing the garlic butter and olive oil etc. How's pasta made with 00 flour compared to one made with semolina flour? What's your preference? Thx. If you look at the picture of my rolled out sheets compared to your rolled out sheets - see how much more coarse your sheet looks on the surface? That gives a hearty, tooth feel but you may want to spritz it a couple of times with water and roll it a few more times to get it silkier. My picture shows a bag of Caputo Semola flour - but what is in that bag is actually Bob's Red Mill Semolina that I ran thru my grinder on super fine - it seems pretty much identical to the Caputo after grinding fine like that. I notice when I use the coarser Semolina, I have to make it wetter than usual and let it sit long enough to absorb it. It's got that bitter, raw "floury" taste which I can't stand. Roller setting #3 made my "fettuccini" way too thick. I think we are talking about two different things when we say 00. I was thinking 00 as the size of the grind and when I was describing the difference between Semolina and 00 in pasta - I was talking about the difference between Bobs Red Mill Semolina (coarse ground - similar to cornmeal in texture) and Caputo Semola (Semolina that's been reground to 00 fine). And when you say you get bitter, floury taste with 00, I think you mean the 00 used for pizza and Italian breads. Sorry for my confusion. But anything I have said about texture of pasta here ... I'm talking about the difference between the fineness of the grind of Durham Semolina. Not completely different wheat sources for the flour. I've never used the "00" flour on the left in this picture. But I have made pasta using half AP and half Semolina. I buy Semolina from Bob's Red Mill. I buy a box with four 24 ounce bags (get them from Amazon) and I buy the Caputo Semola from Amazon too. I'd like to just buy some Durham wheat and grind my own but I don't know how close I would be able to come. Lately I've been running the Bob's Red Mill (coarse grind Semolina) thru my Mockmill on a very fine setting and I get something very similar to the Caputo Semola flour. I'll have to compare the price per weight and see which is the better deal. The Caputo Semola make wonderful pasta. Yeah ... I did notice a 25 pound bag of Semolina for $21 but it's $11 shipping. Still a bargain compared to the others. Ordered 25 lbs ❗️❗️❗️today, but I might have some leftover in the pantry. If I can find it, I'll make it again tonight. Thx for your information. Durum wheat is physically quite hard in kernel form (even though it has lower protein, sometimes resulting in bread that's too soft). I have no idea how the hardness of the kernels translates into grinding performance, but in general, home-milling flour is always a lot like grinding coffee on one of the little grinders with the whirling blade - you get more of the uneven irregular chunks, more that's been pounded to excessively-fine dust, and less of the intended size, than you get from an industrial flour mill. 00 has nothing to do with grind. You're not the first to make this mistake and I'm sure you're not the last either. PS. I enjoyed this post, your dish looks delicious. Thank you! I had never seen that type of flour, only heard its name, and was completely clueless about it. I'm guessing "rimacinata" means "re-milled" (or double milled, or whatever that ought to be called) and therefore a finer grind? Types "0", "00", "1", "2" apply to common wheat (Triticum. aesvitum). It's probably not so different from an old classic, pasta alla gricia. I'm not familiar with pasta alla gricia but I'm going to google it. What made me think of this dish in the first place was reading a recipe for spaghetti carbonara. I read all the comments of how some people add this and add that (peas, mushrooms, onions etc.) and how the traditionalist were so offended. Saying anything additional was just spoiling something that was already perfect. So I made it the traditional way a few times --- and while it was delicious, I found that I felt like I had eaten a bucket of ice cream (all that grease and egg yolk). So I stopped making it. But I also remembered how well the bacon flavors (yeah, I don't know where to buy pancetta and I always have thick bacon on hand) went with pasta. So I just hungry one day and didn't have hardly anything on hand in the kitchen. But I had bacon and mushrooms and onions and garlic and an egg and some semolina. I think I tried spinach with it once - and it's good but I think it detracts rather than adds. It just turned out to be something I really like and it can be made with stuff that I almost always have on hand - so I don't have to make a grocery run. Another thing I like about this dish is that it's so quick to prepare when you get a surprise visitor - you can visit in the kitchen while you make it and most people are amazed to see pasta being made from scratch. It's just perfect as a way to visit with a guest while impressing the heck out of them. I just made it again today and I had a rotisserie chicken in the fridge so I added some chunks of roasted chicken just before I dumped the noodles in. Yummy! Carbonara, gricia, and amatriciana... All three are some kind of relatives - cousins, children, I don't know. Not sure this thick would work for a such but it works well in a soup. I've never used fresh pasta for a carbonara...but I am inspired by the 1 person recipe...it looks doable. I had to try the 1 person sized pasta in my little processor...and it was grainy like yours... but then I realized I'd have to knead it forever and a day by hand. That wasn't going well...(I've done it with 50/50 blends before by hand). So I put back into small processor added a little bit of water till it barely formed...rested a long while. Rolled it out...cut it and it is currently in freezer. Definitely a different texture compared to my usual pasta dough. Lesson I learned. Don't use 100% semolina if your making by hand entirely unless your ready for a lot of work. While I could make a 1 egg pasta dough in this tiny processor attachment to my blender...I'd not try to do so with more volume. But it was fun to try it. Thanks for the inspiration. When you say it would take forever and a day to knead by hand. Do you not have an Atlas roller? I don't knead the dough at all. I simply press the moist semolina/egg into a lump while it's in the Cuisinart (with the blade removed) and then take it out and press it down on the counter with my hands to flatten it out a little and then run it thru the roller on the widest setting - fold it and run it thru again - fold it and repeat a dozen or so times. It becomes silky smooth just by running it thru the roller. No kneading at all. I really enjoyed reading the article you linked to. I still do it a bit differently than the author but I really liked the way the author described all the conflicting methods that different people insist is correct and then put them all to the test. If I know far enough in advance, I will pull the egg(s) out of the fridge hours before I make pasta (or cookies or anything really - much prefer room temp eggs) --- and I will rest the dough (or in my case the moist granules) for an hour and add a spritz or two of water if it seems too dry as it's resting/absorbing. I do prefer the more yolk/less white noodle but it's not enough difference to me to justify the hassle of trying to save the left over egg white to make waffles or something. to have you two guiding me through this new task, so that I do not waste much time due to trial and error. I have NO rollers...just my two hands. Hey...it worked...but I didn't expect it to since I was working it by hand and it is tough with that flour. Clearly...100% semolina cooks much longer than my other recipes. But now I know. Would a video be helpful? I may have to make a little video of the pasta method I use. I could make some with coarse Semolina, some with fine Semola, some with half AP flour, Whole Wheat etc. And I could show trying to roll it too dry and too wet and just right. If that would help get a picture of the process. Too dry is a pain to force the dough thru the rollers - it crumbles and doesn't get silky - too wet will go thru the rollers easily (but sticky) and will get silky but the dough will stick to itself unless you keep dusting it with flour. Just right will roll easily and be flexible and the noodles won't stick to each other unless you pinch them together. It's a must cause it is IMPOSSIBLE to roll out by hand otherwise. I rested it 30 mins or more covered...nope...I needed to wait much longer. But...I just finished eating half of the pasta I made...expected it to be tough but it was nice and firm. I simply boiled then added to a wok with some fermented bean paste, oil, garlic and ginger and I few dried shrimp and bacon. Needed fresh cilantro and perhaps a bit more oil cause the pasta sucked it up. That looks delicious. I've got tons of ginger I need to use up - I'm going to have to try your version now. BTW ... I do this all the time without resting the dough at all - but I have an Atlas roller. I went back and looked at my photo of the cup of flour and egg and it looks closer to 3/4 of a cup than 7/8 cup so I edited to original post to 3/4 cup. Seems most people who have tried this have found the dough too stiff. I really just go by how it feels. I can squeeze the dough in my hands and press it out flat with my hands. It's like playing with Play-Doh if you have kids/grandkids or remember Play-Doh from when you were a kid. So if your dough is too tough to roll out it means you need more liquid or less flour. The spray bottle of water makes it easy to spritz a small amount of water to get the dough more workable. I used the bobs red mill semolina...and it is noticeable for some time while kneading...the little "balls". What I am excited about is the fact I was able to do it in that little food processor that I HATE and wonder who would ever design such a horrible thing. At least it did work. I honestly never thought of using a processor before since I generally made mine by a KA mixer...but that is limited if you don't have enough dough in the bowl for the hook. I started making mine by hand cause my KA is old...and struggles any more with dense doughs. I used to have their extruder...and my sons loved watching me make pasta's that way. NO idea what happened to it...it just disappeared about 10 years ago along with other attachments that was in a box in the pantry with the sausage stuffer. Perhaps I gave it to my son and forgot. Who knows. BTW... if you have never tried a fermented bean paste on homemade pasta...you are missing the boat. Yes, you wouldn't (or I wouldn't anyway) initially think that a food processor could do a decent job of anything resembling dough, but there are at least some that don't do a bad job - if you remember that it's a food processor and act accordingly. Wow, day and night difference! My family enjoyed it so much! Thank you, Andy and David! I'm a big fan of Giusto's products!